In an earlier post, I talked about this transition we see as the beast obtains a spokesman, and how that the first designations applied to the beast tend to make us look for a person as we try to figure out who this beast is. The spokesman is clearly a person, just as John Kerry is now the spokesman for the United States, in his role as the Secretary of State. However you and I need to get this straight; this “it”, is it the beast, or the spokesman? I am casting my vote for the spokesman. 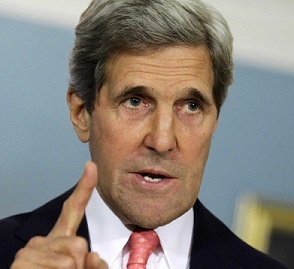 John Forbes Kerry is an American politician who is the 68th and current United States Secretary of State. Do not make the mistake of thinking this spokesman is feckless like our Secretary of State, this person is deadly and will command great power. 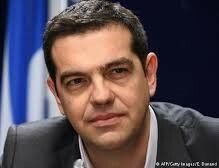 Another that has caught the eye of many is Alexis Tsipras, the Prime minster of Turkey. A devout atheist it might not take much for him to become a devoted Muslim. At this time – we have no solid idea who this spokesman – the antichrist scripture tells us about – is, although Recep Tayyip Erdoğan, the President of Turkey, has declared himself to be god several times. In a earlier post we read that the war it makes lasts 42 months, three and one half years. Is there a difference between making war and exercising authority? Authority is the Greek word exousia, and means: (in the sense of ability); privilege, that is, (subjectively) force, (objectively) mastery. Apparently there is little difference, for if you restate verse five with alternate wording, you see that in both cases they are deadly. In 8:24,25 – We are made aware of the destructiveness of this spokesperson/mouth.”His power will be mighty, but not by his own power, And he will destroy to an extraordinary degree ; He will destroy mighty men and the holy people. And he will destroy many while they are at ease. One last passage to show that this is all part of God’s plan, and fills all the parameters. This is one that Jesus revealed to the disciples. Luke 21:22-24 ESV for these are days of vengeance, to fulfill all that is written. (23) Alas for women who are pregnant and for those who are nursing infants in those days! For there will be great distress upon the earth and wrath against this people. (24) They will fall by the edge of the sword and be led captive among all nations, and Jerusalem will be trampled underfoot by the Gentiles, until the times of the Gentiles are fulfilled. To say “for these are days of vengeance, to fulfill all that is written.” Is to tell you straight that this is the time of God’s wrath upon the earth, and it will be global. Muslims are killing Buddhists in Thailand, the indigenous people of Papua, New Guinea, Chad, Nigeria, and of course, in your country also. Before we part for today, let me clarify something. This is not the christian community as I understand it today (moments before the rapture.) It is those that come to Christ after the rapture has taken place, and we see them called the Saints and the martyred. Revelation 6:9-11 ESV When he opened the fifth seal, I saw under the altar the souls of those who had been slain for the word of God and for the witness they had borne. (10) They cried out with a loud voice, “O Sovereign Lord, holy and true, how long before you will judge and avenge our blood on those who dwell on the earth?” (11) Then they were each given a white robe and told to rest a little longer, until the number of their fellow servants and their brothers should be complete, who were to be killed as they themselves had been. While this could be speaking of the church, it also speaks of those martyred during the years of wrath. Revelation 12:11 ESV And they have conquered him by the blood of the Lamb and by the word of their testimony, for they loved not their lives even unto death. The second group, the martyred after the rapture, will not have grace, as we had. They will have to prove their allegiance to God at the edge of the sword. See, the problem is that we think God is just a weak wimp, and that is not the case. You want a daddy that spanks you? I suspect you have been spanked, you just do not recognize it. God does have rules, and the day will come when payment will be collected. The number of those, regardless of how they must get there, that will choose to come to Jesus, will be uncountable. What is the distinction then between those that are caught up in the rapture, and those who are martyred? At this time, a pre-rapture scenario, we live in what is known as the age of grace, a time of God’s mercy. What that means is, that in a sense I have the freedom to play the fool, doing as I please, knowing that my sins are forgiven and covered, and that I will not be judged for sin. However that statement does not exclude me from judgment. Merely to say to you will not be judged in one way, does not exclude you from being judged in another. As Christians we have all heard that we will stand before Jesus in judgment, but that judgment has more to do with what you did with Jesus. So, standing before Jesus as a believer, all the chaff – stuff I think is important – will be burned away. Down here on earth, we think our stuff makes us special and privileged. Suppose this burning away of the chaff leaves you with no underwear; how privileged will you feel at that moment? Truth is – there is no sorrow in heaven, only the joy of being in His presence. The Apostle Paul told us that we should not allow our freedoms to cause others to stumble. It could be as simple as a friend of mine puts it when he says that some of his colorful language is not cussing and others should not be offended by it. Whether that is true or not, that other person, especially in Recovery groups, may have suffered tremendous verbal abuse as a child, and sitting there forty years later, not have a clue how to cope with what they perceive as abuse. Now extend this idea to social drinking, or your freedom to smoke pot. Some people, raised religiously, believe that the simple act of smoking can send you to hell. Do you think, I, with my co-dependent head, have time to worry about all this potential guilt? Absolutely NOT. I do however have a brain, I can read, and I have a conscience. I get it, and though yes, I like the taste of a cold beer, I choose not to partake because I have a calling upon my life – and His name is Jesus. Having this understanding helps to keep me from playing the fool. I am not telling you how to run your life, you are free to be a fool if you want, and you are free to take it to the extreme. I will have difficulty feeling sorry for you when you stumble up to the microphone to say, Hi, my name is …. ; a grateful believer, and I struggle with a meth addiction, alcohol addiction, and what ever else you spew out of your mouth; knowing full well that your own selfishness put you in that place. I will however, congratulate you for the bravery that it took for you to be honest and declare that you played the fool, finally understanding that you are not in control of your own life. We, as followers of Christ, and those of us in Recovery, made a willing and conscious effort to turn our lives over to our higher power – Jesus Christ, for there is no lasting help in anything else. This entry was posted in End times, Prophetic, Thoughts on scripture and tagged Alexis Tsipras, antichrist, blasphemy, end times, Islam, Israel, Jews, John Forbes Kerry, John Kerry, last days, Minister Alexis Tsipras, muslim, prophecy, Recep Tayyip Erdoğan, Revelation, Secretary of State, Syria, Turkey, Vladimir Putin. Bookmark the permalink.